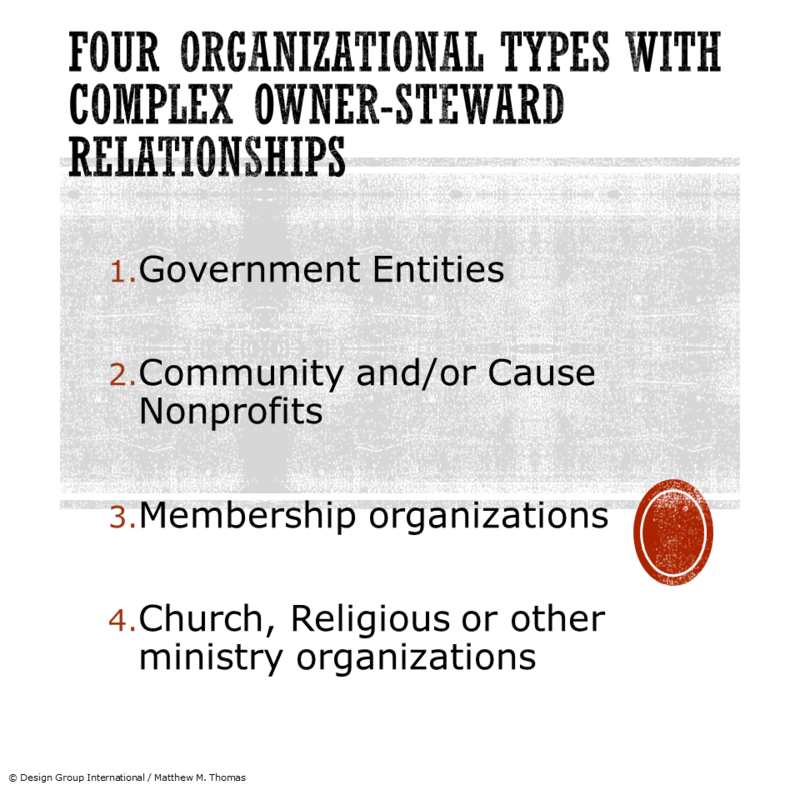 Steward Leadership: Who are the owners? Recently, we have been talking about Steward Leaders and their relationship to owners and finances. These posts have led some to ask, "Who are the owners? On whose behalf does steward leadership manage resources and produce results?" In a traditional small business or closely-held corporate environment, this is usually quite clear: the leader works on behalf of the equity shareholders, the owners of the company. In a healthy enterprise, the Steward Leader manages on behalf of the owners as a whole, speaking together. In a corporation with a board, the board itself is a steward of the larger collection of shareholders. This makes even C-level management an under-steward of this core stewardship entity. Governmental entities: In democracies, the franchised general public are the collective owners of the municipality, park district, state, county or other entity. The elected officials are the stewards on behalf of the general public as owners. The trick is, of course, that the people are also usually the primary beneficiaries of the stewards' work, and, at many levels, its customers. Teasing out the differences is often fraught and complex. Community and cause non-profits: Once again, in democracies, the general public are the collective owners of the non-profit - although in this case, voting rights aren't directly relevant, since the nonprofits aren't elected, nor typically granted police powers. The cause is intended to benefit the general public through its efforts. The active participants steward the nonprofits resources on behalf of the public for the common good. Knowing on whose behalf the steward leaders operate helps with strategic process - particularly measuring and reporting the right things to the right people. When steward leaders know who they really work for, making sure those owners' needs and goals are met can become more straightforward. Design Group International offers an E-book entitled, "Wheel Forward or Spiral Downward: Making a choice for strategic design." In it, readers examine six questions to get at creating and maintaining positive organizational momentum. Check it out for free by clicking the button below.